This obelisk stands in the Central Park, just west of the Metropolitan Museum of Art. The site is a lonesome place in Central Park, although many people come to other places like The Sheep Meadow and Bethesda Fountain in Central Park. It's quite interested thing in the busy New York City. The easter face of this obelisk can be seen well through the window of cafeteria at the Metropolitan Museum of Art. When you are tired of seeing an enormous collection in the Metropolitan Museum of Art, it'd be a good idea that to take a rest at the cafeteria. There are several directions for the obelisk site. I think the most convenient way would be to enter into Central Park through the statue of "Group of Bears" at East 79th Street along Fifth Avenue. Passing through the Playground and south side of the Metropolitan Museum of Art, you can see the stone-made tunnel "Greywacke Arch". After passing through the tunnel, turn right at the next corner. Since the south side of Central Park (downtown side) faces 59th Street, we often go into Central Park from here. 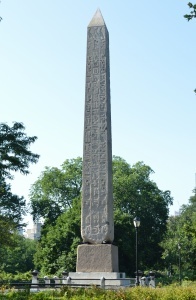 However, the obelisk stands far in the Central Park, and there is no straight way. If you don't visit the Central Park itself, you should visit here through the way above when you visit the Metropolitan Museum. Originally, this is one of 9 obelisks at least [2 in Heliopolis, 7 in Karnak], which were erected by Tuthmosis III. In between around 23 BC and 12, the first Roman Emperor Augustus [reigned 27 BC - AD 14] had carried 2 obelisks from Heliopolis to Alexandria for decorating the front of the Caesarium Temple (*1) at Alexandria. But the one of two obelisks , which remained after the Temple went into ruin, fell in an earthquake in 1303 A.D. (*2), and nearly being lost at sea in 19th Century. This was firstly transported to London. Then the remained one was transported to New York later. Therefore, there is nothing in Alexandria at present. (*2) A famous "Lighthouse of Alexandria" which is one of Seven Wonders of the Ancient World, was also heavily damaged by this earthquake. 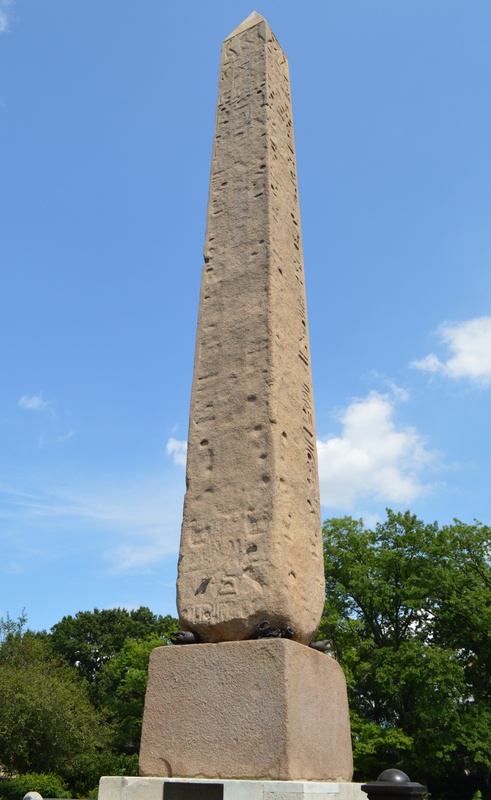 Both these obelisks, which were once in Alexandria, are called "Cleopatra's Needle". 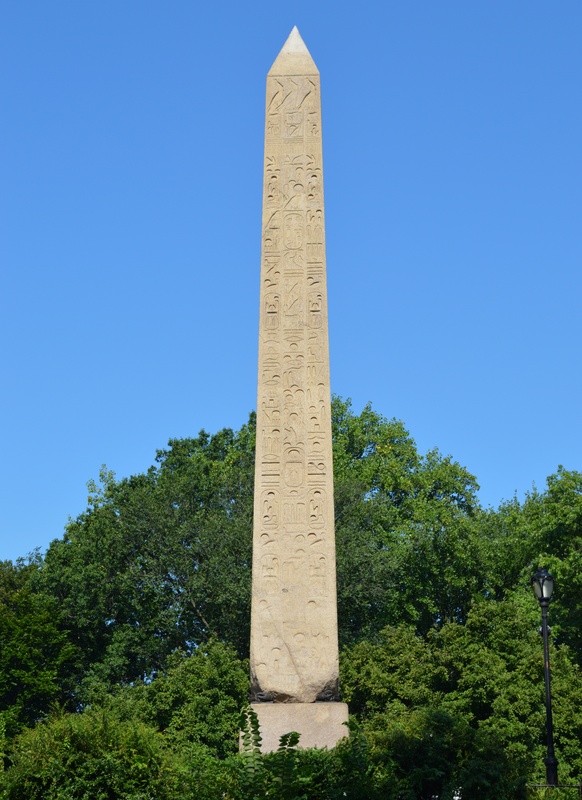 Here is a story on Cleopatra's Needle in London. Inscriptions: Labib Habachi says in his book "The Obelisks of Egypt", Tuthmosis III is drawn as a "sphinx" making offerings to the Gods of Heliopolis, on each side of pyramidion of this obelisk. Although it's not clear, we can confirm it at the north side of pyramidion. On each side of the obelisk are inscribed with hieroglyph of three columns. The central column was carved by Tuthmosis III, and subsidiary columns both sides were added by Ramses II. Although the hieroglyph is almost impossible to read it due to the heavy damage particularly at south and west sides, but it can be read at east side. 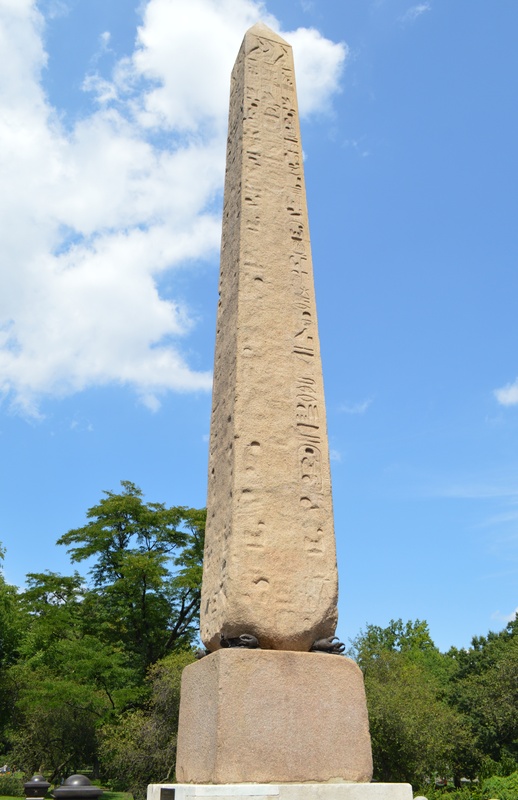 When comparing the directions of the inscriptions of two obelisks: New York's and London's, it's assumed that the current New York obelisk stood at the left side of the Temple, and the London's one stood at the right side. Furthermore, the current south face of New York's one and the current north face of London's one are assumed that they were originally standing facing towards our side. 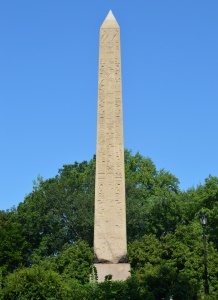 Unlike Egypt, it has a lot of rain and heavy traffic in New York, the obelisk conspicuously deteriolated in recent years due to dirt and acid rain. Therefore, in January 2011, Dr. Zahi Hawass, who was the Secretary General of the Egyptian Supreme Council of Antiquities at that time warned that there was not enough preservation. Following that, Central Park Conservancy of New York City and the Metropolitan Museum of Art completed a three-year planning period, and in May 2014 they carried out extensive cleaning work surrounding the obelisk with the scaffolding. Before the cleaning work was done, this obelisk was quite dark, but now it is regaining its original color. Transportation to New York: The story for Cleopatra's Needle in New York backs when the Suez Canal was opened in 1869. As the appreciation for the aid of the construction of the Suez Canal, the ruler of Egypt, the Khedive Ismail Pasha, offered the United States to present an obelisk. However, at the beginning, the Americans did not show the interest in this favorable proposal. 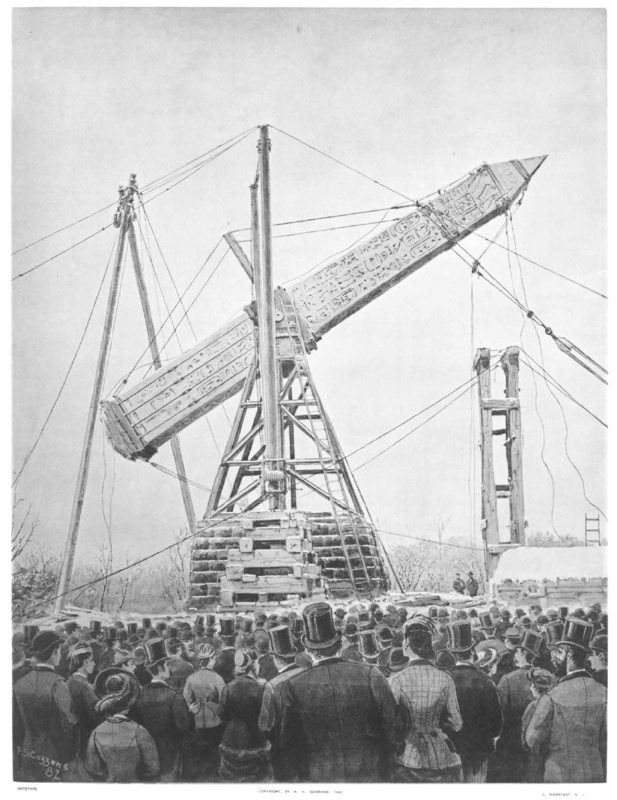 But when they knew the Obelisk would be transported to London in 1877, they also began to have an Obelisk, and started the negotiations. 2 years later, they got an authorization from Egypt for transportation, in 1879. Henry H. Gorringe, a lieutenant commander of the U.S. Navy, was appointed the task of transporting the Obelisk and its pedestal to New York. 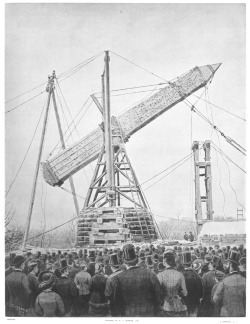 After a lot of difficulties, the obelisk was loaded on the Steam Ship "Dessoug" which was altered for cutting the hole in the starboard bow for slipping it into thr ship. The obelisk and its pedestal departed the Alexandria Port on June 12th, 1880, and through Gibraltar, then arrived at the offshore of Staten Island (or at the quarantine station of New York Port) in New York City, on July 20th 1880. After the unloading of the obelisk, the pedestal was carried and the "Dessoug" docked at West 51st Street of Manhattan on July 20th. It took 32 horses hitched in 16 pairs to drag the 50-ton pedestal alone through the streets of Manhattan, and the pedestal was in place on the small hill (Graywache Knoll) in Central Park. The obelisk was transferd on the wooden pontoons, and landed at a slip at West 96th Street of Manhattan on September 17th. Then it was carried through West 86th Street, and entered from Fifth Avenue at 82nd Street. It took 112 days until arriving the site on January 5th, 1881. The average speed was at the rate of 97 feet (less than 30 meters) a day. Bronze Crabs: The four corners of the bottom of this obelisk are missing, so has an unstable shape and it looks that it would be toppled even with a slight earthquake. Perhaps because of this, 4 bronze crabs are packed at the missing parts to support obelisk. If we look it carefully, we can see the origins of this obelisk are engraved in English on the part of the nail of the crab. I thought these crabs were placed when the obelisk was re-erected in Central Park. However, I noted that the two bronze crabs made in Ancient Roman Era are conserved in the Metropolitan Museum of Art. In fact, the bronze crabs currently placed at the base of the obelisk were made when it was re-erected in Central Park. But the bronze crabs were originally made even when the obelisk was re-erected in Alexandria. So the idea on crab ittself belongs to an ancient Roman, not a modern American. According to the website of the Metropolitan Museum of Art, the two bronze crabs were given by Henry H. Gorringe who conducted the transportation work to New York. The provenance was engraved in Greek and Latin on the original crabs. In fact, just as there are in Alexandria, Mersa Matruh, and Aswan places called "the bath of Cleopatra", although there is no evidence that the queen ever bathed there, and the Canal connecting between Alexsandria and the River of Nile is called as Cleopatra's Canal. In the case of these obelisks, as the earliest record, the expression of "Cleopatra's Needle" is seen on the etching by a painter André Thévet in 16th Century. The southern and west sides of obelisk were so close to trees that I could take pictures only in looking at the obelisks at a fairly steep angle. Because it is a quiet place in Central Park, there were not many people visiting here, so I was relaxed to take pictures.